Those two things cancel each other out, right? This year Kalen and I ventured to San Francisco to celebrate our four year anniversary. We both love California but had never been to the northern coast so we decided it would be the perfect place. We stayed in an Airbnb in Bernal Heights which was great because we were close to Bernal Heights Hill and the Mission District. We got 3 day bus passes that took us pretty much anywhere and we walked, a lot. I would say my least favorite part about San Francisco was walking straight up hills. By the end of our trip my calves, hamstrings and glutes were dead. In just three and a half short days we managed to do so many things! 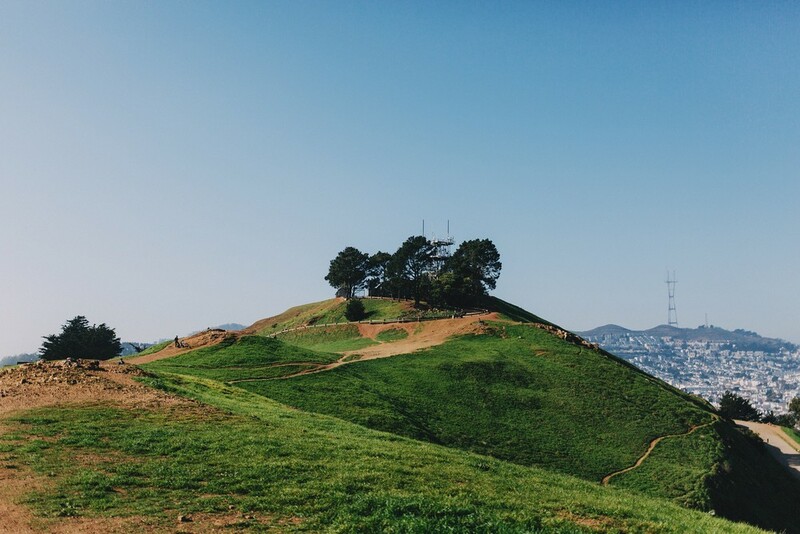 We climbed Bernal Heights Hill for some fantastic views of the city and cute dogs. We relaxed at Mission Dolores Park and saw even more cute dogs. We went downtown and walked through Chinatown and rode a trolley to Fisherman's Wharf and watched the sea lions at Pier 39. My favorite part of our trip was traveling all the way across town to Land's End and watching the sunset. On our last day we hit up the tourist spots. We ate Bob's Donuts, saw the "Full House" house and then realized we were actually looking for the Painted Ladies and Alamo Square Park (which we eventually found), and we ended up at the Golden Gate Bridge at dusk. Our most important mission (and almost always is our most important mission on vacation): good food. We brunched at Precita Park Cafe, Boogaloos and the Crepe House. We had a nice dinner at Alamo Square Seafood Grill and Fog Harbor Fish House. I would recommend eating at any of those places if you visit the city. Also, the weather in San Francisco is on another level. Compared to New York in mid January this place was heaven. Even though we had beautiful sunny days each day we were there, I was disappointed that I didn't get to see #karlthefog.